Artificial intelligence is revolutionizing cloud innovation. Learn how to choose a cloud partner that supports your AI-enabled future and give your business a competitive edge. Lynda Stadtmueller is Vice President for the Cloud Computing program at Stratecast|Frost & Sullivan. Research areas include IT transformation; public, private, and hybrid cloud; and data center infrastructure (servers, storage, and networking). She is a frequent speaker and contributor to technology publications. 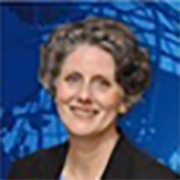 Ms. Stadtmueller has over 20 years of experience in the communications industry. Prior to joining Frost & Sullivan in 2008, she served in a number of leadership positions with AT&T and its ventures, as well as telecom expense management provider Telwares. Ms. Stadtmueller received a BA degree from Duke University.